James Batchelor’s garden is referred to in a newspaper article as “yard-art mosaic that’s a little bit Mardi Gras, a little bit Looney Toons, a little bit roadside Americana.” It is filled with vegetables planted in painted barrels, silk flowers, a stuffed goat chained to a bowling ball, a “life-sized, voodoo-doll-looking woman” that had to be moved to the backyard when men talking to her got angry when she wouldn’t answer back. There is also a Batchelor family “Walk of Fame” with a star-studded square for his late wife (who didn’t like the garden) and each of their nine children. People bring him things to add to his garden all the time and he is pleased that people drive by to take a look. Batchelor’s house is located at 761 Wayne Court, in the Walnut Hills neighborhood of Cincinnati, Ohio. In the Walnut Hill area of Cincinnati is a local legend with a little bit of roadside flair. 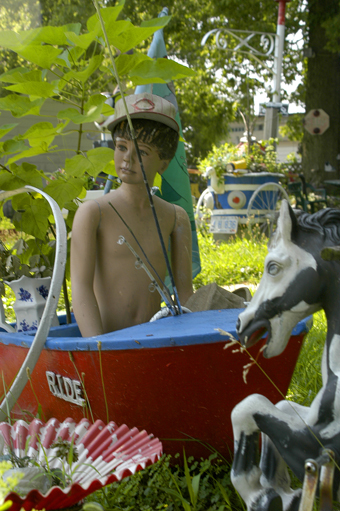 James Batchelor’s Odd Garden isn’t easy to find but the locals know it well; they even contribute to it. Mr. Batchelor, 97 years young, allowed me the privilege of seeing his garden over the summer. While the heat was too oppressive for him to join me I was allowed free reign to explore the garden he had constructed over the past 10 or 15 years. A stark contrast to the walls of brick and concrete nearby, the garden is full of color and life. Mixed in with his tomatoes, greens, and peppers are all sort of odd stuffed animals and whimsical items. Various buckets and basins, all covered with splashes of paint, hold up his displays and odd arrangements. I thought the one garden behind his house was impressive until I followed the line of his finger across a back alleyway to another piece of property. This area looked as if someone took a little bit of Disney World, a costume shop, and an art supply store, mixed it together in one giant bowl and dumped it on the lawn. It is wonderful. Back inside I asked him if folks still come by to add items to the world he created. He replied, ”yeah, a little bit here and there.” I questioned him about the multi-colored walkway out in his furthest garden with various names on it. He said very proudly and full of love that those names were his family. Then suddenly, the almost century old man jumped up with a gleeful secret he wanted to share with me. He opens the door to a creation he was far more excited about than his garden. 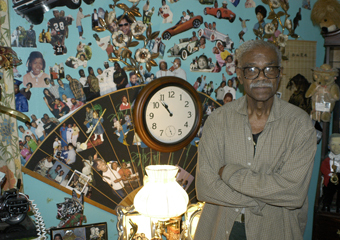 His sitting room was a living alter to all his various family members. Literally thousands of faces stared back at me with smiles; they are the photographic cut outs of all those he loves and love him in return. Every inch of all four walls and all the furniture are covered with them.